As you can see, I'm writing about provider architectures lately. Last week, I wrote about Bridging and Provider Bridging where you can read that the traditional bridging is not enough today for large networks because service provider and cloud companies need more than 4096 VLAN. Therefore, Provider Bridging is an option because we can address till 16 millions of networks with double VLAN tags. However, Provider Bridging is not scalable due to the fact that it needs big and expensive TCAM because customer MAC addresses are saved by every router, even core and spine routers. As a result, Provider Backbone Bridging (PBB) is here to solve this problem. 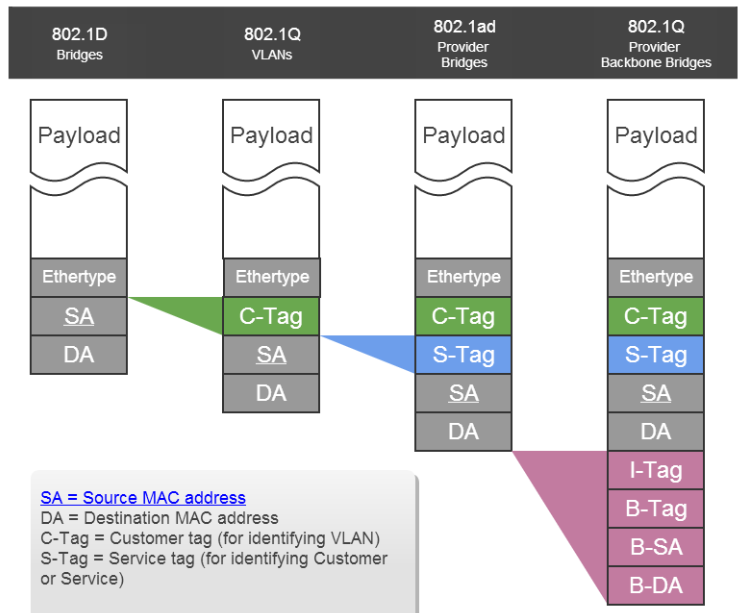 Provider Backbone Bridging is the standard 802.1.ah by IEEE and the main different with regard to Provider Bridging is the encapsulation method to hide customer MAC addresses to the backbone instead of doubling tags. This is a great advantage because we don't need expensive routers in the backbone with big content-addressable memories (TCAM) for large networks but spine and core routers speaking PBB. Therefore, inner (customer) MAC addresses are encapsulated within outer (Provider) MAC addresses which is useful for hiding customer frames to the backbone. 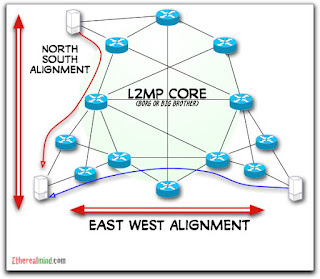 The encapsulation technique is also called Overlay and there are many technologies today that use this method to hide frames and interconnect layer 2 networks. For example, traditional VPNs are Network Overlays like OTV, VPLS or LISP; We can configure Host Overlays as well like VXLAN, NVGRE or STT; or even we can have a mix to make Hybrid Overlays. Anyway, it's a good way to make simple and scalable networks without worrying about the underlying network because Overlay Networks allow us to change, manage and deploy new technologies quickly, although, sometimes, the architecture could seem more complex and difficult to manage. 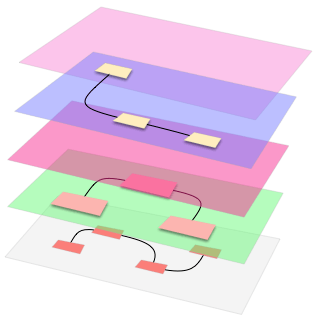 PBB implements intelligent bridging which is useful for layer 2 multipathing. Therefore, while traditional networks had limited performance due to the fact that traffic was North-South for web content, email, etc, flat networks like CLOS networks, along with PBB, are more manageable and scalable thanks to East-West alignment, which offer better performance and reliability for server to server communication, useful for cloud computing and hadoop architectures. Multipathing is a great feature for CLOS networks but although PBB uses encapsulation in the data plane for hiding customer frames, it may use Spanning Tree in the control plane for loop avoidance. This is a big problem, I mean, if we use Spanning Tree (STP) in the control plane, we'll have the same inherent problems than STP; nothing about layer 2 multipathing, scalability problems, convergence delays, North-South traffic, etc. 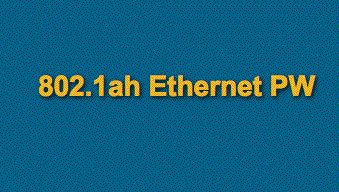 Consequently, we can implement PBB-TE, which is the 802.1Qay standard, PBB-EVPN over MPLS networks or even SPB, which 802.1aq standard, for better performance, reliability and real layer 2 multipathing. Regards my friends, this is going too fast, keep studying my friend!